What a captivating movie for the anime ignoramus! Naruto, Sakura and Shikimaru are three young ninjas who are on a quest to capture a ferret and return it to a village. Tree-flying is simple and fun. But from there, the story expands. An ancient nomadic tribe befriends an injured young Naruto. The legend of the Stone of Gelel slowly emerges from quaint caravan travel stories. A powerful Master is after an ultimate goal: to end all war forever and bring about utopia. The film explores the moral trappings of such grand ambitions. I found this angle the most interesting. There is also cute humour running throughout which is a nice touch. The disc features pop-ups which explain the basics of the genre, as well as some key Japanese words. I appreciated these tremendously but I imagine purists may be riled. They might also be upset by the feature DVD’s audio tracks. The original Japanese sound comes in Dolby 2.0 whereas the English track is a very rich and impressive 5.1: let’s just say it makes you glad to own a surround-sound system! The animation is nice to look at but doesn’t pretend to aim for the lush panoramas and details of Hayao Miyazaki’s Spirited Away; rather it is fast-paced and high on ninja interactions, predictably enough! 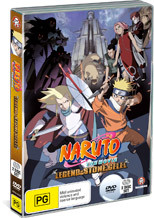 The second disc presents a lot of extras which I list: Creating the World of Naruto the Movie; Write and Adapt like a Ninja; Words from Japan; and original trailers and storyboard. The first featurette has a lot of American voice actors rambling about their amazement: something that failed to amaze or amuse me, but I guess others would be interested. This is a handsome package and fans do not need any persuasion. The curious should watch it, especially with a friend, because only the super-fussy would be disappointed!